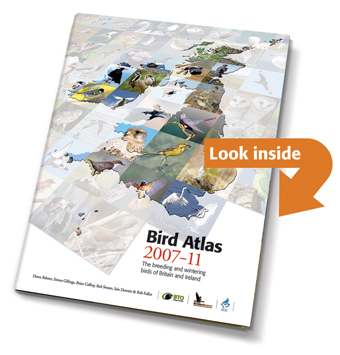 Get a hold of a copy of Bird Atlas 2007-11, the most important British and Irish Bird Book for decades. Also now available as an ebook..
Also available from Amazon for Kindle devices and apps. 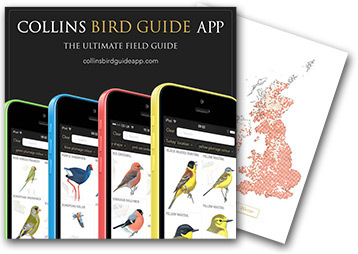 ..and as an add-on with Collins Birdguide App. "Nowhere else on earth is as well known in terms of bird distribution and populations thanks to the astonishing effort of accomplished volunteers and the BTO". "...the magnificent new atlas of British and Irish birds is the most riveting bird book produced in Britain for years". "Buy it! Read it! And think about what it shows of the ornithological reality of the UK and Ireland". "The most important British and Irish bird book for two decades". Discover the changing fortunes of the birds of Britain and Ireland through the expert analysis and interpretation of scientists and authors Dawn Balmer, Simon Gillings, Brian Caffrey, Bob Swann, Iain Downie and Rob Fuller. Have the latest scientific findings about distribution and change at your fingertips, including chapters telling the atlas story and highlighting the factors influencing our changing bird fauna...all is revealed in this new book.